For people who, like me, grew up paddling the rivers of Ontario and Québec, the rivers of Northwestern Canada introduce new and sometimes daunting challenges. Compared to the rivers of the Canadian Shield, the rivers of the Yukon and Northwest Territories flow out of the relatively young northern reaches of the Rocky Mountains. Whereas Southern rivers are often described as “drop and pool” (isolated rapids separated by slow moving sections), Northern rivers often have very long sections of continuous current. Anyone considering paddling a canoe down one of these rivers should become familiar with the different rescue techniques often used in the North. Many groups running northern rivers choose to rig their gear into their canoes, either by securing with rope or webbing to anchors fastened to the inside of the boat, or by using a canoe spray deck. Since there are no pools at the end of rapids, this helps prevent gear from getting lost — it is easier to chase one boat down the river than a boat and several packs. It means, however, that the boat becomes too heavy to use a canoe over canoe rescue. Following are some options for boat rescue for this different style of canoe tripping. The Northern Rescue should be used on rivers that aren’t extremely wide, and have a good shoreline to pull boats up on. 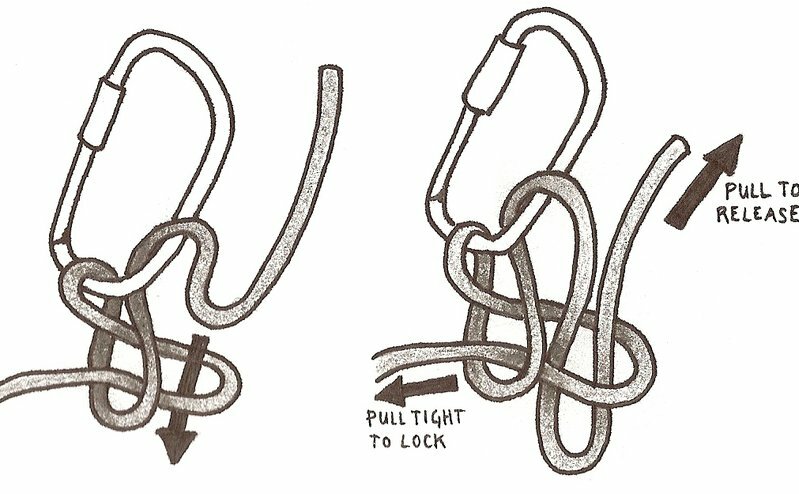 Attach 2-4 high quality throw bags together using figure 8 on a bight and locking carabiners. 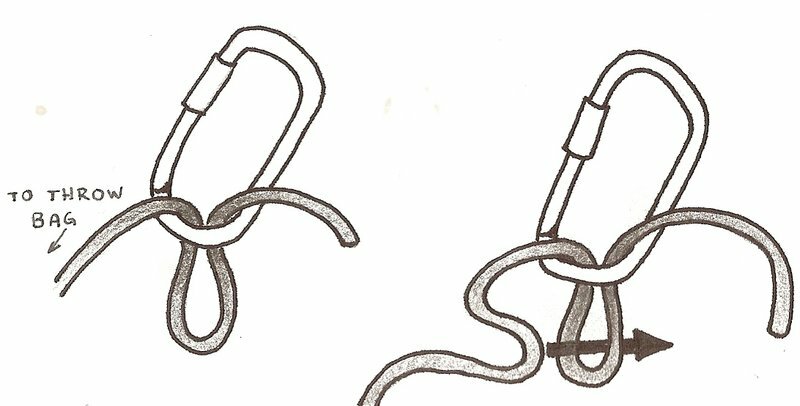 Total rope length depends on preference, but one gauge would be to have around two thirds of the river width. 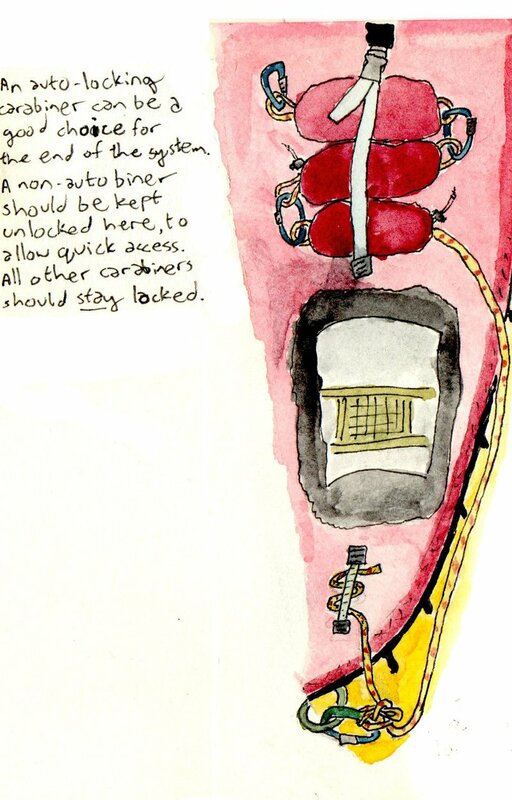 Attach a carabiner to one end of the system. 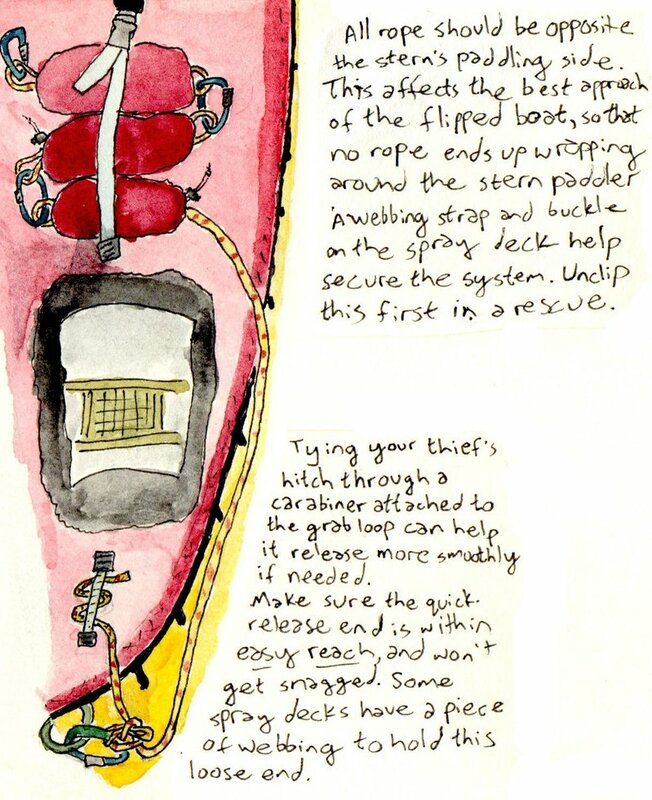 The other end of the system gets attached to the rescue boat (at the stern thwart or the stern grab loop) with a thief’s hitch, or other quick release system. Carefully integrate the system into the boat. It is important to make sure the rope will not wrap around the rescuer when it comes under tension. An effective way to do this is to have the whole system on the sternperson’s non-paddling side, and approach the flipped boat on that side. Be very aware of rope management – 150 to 200 feet of rope can be a large hazard. Spray decks often have a strap to hold throw bags in place. Approach the flipped boat and grab on to it. Take a breath – once your rope system is in the water, the clock really starts ticking. This is your chance to prepare yourself and your bow partner, and look for a good spot on shore to head for. Also remember that the swimmers are your first priority. If you clip on to the boat, and then have to release to help swimmers, you have made the problem worse by adding a ton of rope to the equation. When you are ready, clip onto the boat, and throw your rope system in the water. Paddle as fast as you can towards the spot you picked on shore. To give yourself more time, head for a spot downstream of your location. Do not aim for a wide eddy – your boat will stop, and the line will come under tension before you can get to shore. As soon as you get into shore, get out and pull your boat up. If there is any slack in the system, start pulling rope in. That will allow you to release some if you need to, and take the tension gradually instead of shock loading the system. If there are bushes, a tree, or a big rock, you can run around them, and use friction to take some of the tension. If all goes well, the flipped boat will pendulum into shore, and you can pull it up to you, or walk down to it and empty it. The mid-river re-entry rescue can be used in some situations where a Northern Rescue is not possible. Long canyons, very turbulent eddy lines, or a very wide river may make it too difficult to get to shore. It also allows swimmers to stay with their boat, which may be desirable for rescue scene management. The only set-up required is coaching the group on the mechanics of this rescue. For swimmers, it means staying with their boat instead of swimming to shore or climbing onto another boat. It may be a good idea to also have a Northern Rescue system set up, and have both options available. Approach the flipped boat and grab on. With one hand, reach across the boat to the far gunwale, and pull up, while pushing down on the close side. Alternatively, lift by the grab loop of the boat to flip it. Once the boat is righted, one or both paddlers in the rescue boat can stabilize it by holding the close gunwale. If the boat is rigged well, air pockets in the gear should give it enough buoyancy to float with the gunwales above water. Coach swimmers back into their boat in the same way as with a T – rescue. Continue to stabilize their boat. Find a safe spot to paddle to shore as a two boat raft, or bail the boat until it can be paddled alone. Whatever rescue you choose, remember the concepts of effective rescue scene management. Gear is at the end of the rescue priorities, after you have ensured the safety of yourself, your rescue team, and the swimmers. Additionally, any rescue involving rope adds a potential hazard to the rescue. Be very conscious of rope management, and be aware that in some sections of river, no boat rescue is possible, and your best option may be to ride out the rapid until you find a calmer section. It can be very beneficial to set up and practice these rescue techniques before your trip, even if you use a slow moving section of current on a river near your home.